A tasty Caesar salad dressing is a very good thing to have; luckily it’s a very simple thing to make for yourself at home. I use a high speed blender to make mine, but a food processor or a standard blender should work as well; you need something that you can pour ingredients into while you’re blending, so a Bullet style blender isn’t going to work here. This Vegan Caesar Salad Dressing is perfect for making a traditonal-style Caesar Salad; top with coconut or soy bacon bits, and some Earth Island Parmesan shreds for a real authentic taste. It also goes amazing with some seitan chicken in a Chick’n Caesar Wrap; use a pita and a panini grill to make it extra awesome. Combine aquafaba, lemon juice, white wine vinegar, worchestershire, garlic, dijon mustard, garlic powder, and salt in a small blender jar. Blend on low speed until well combined, about 10-15 seconds. On the lowest speed with the blender running, pour in the oil in a steady stream, until all oil has been added. Increase the speed to high, and continue to blend for an additional 10-15 seconds more, until the consistency is smooth, and creamy. Take care not to overblend. Transfer the dressing to an airtight storage container. Stir in the nutritional yeast flakes - I don't like a lot of it in this recipe so I use a tablespoon, but use more if you're a big nooch fan. Add fresh ground pepper to taste - maybe 1/2 a tsp. 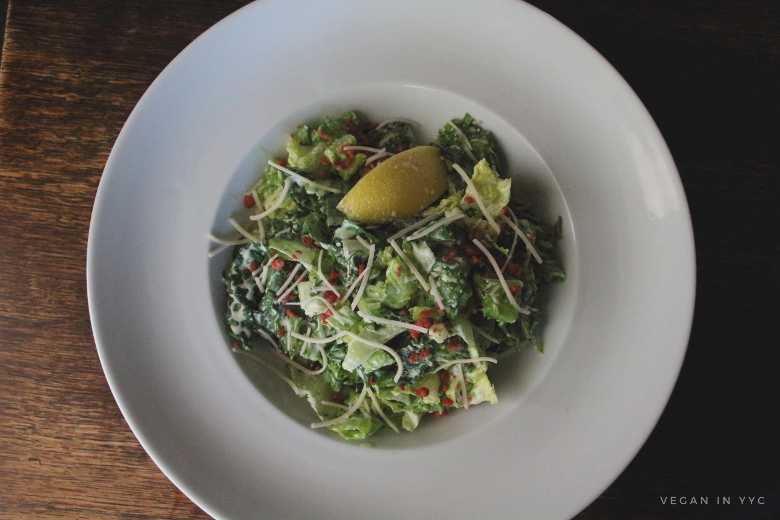 Serve on top of romaine lettuce, well-massaged kale, or use anywhere you'd use conventional Caesar dressing.